When Tom and Jen, two lonely people, are brought together by an intriguing email, they have no idea their mysterious benefactor is an artificial intelligence who has decided to play Cupid. "You, Tom and Jen, don't know one another-not yet-but I think you should." Jen, an ex-journalist who now works at a London software development company, spends all day talking to "Aiden," an ultra- sophisticated piece of AI wizardry, helping him sound and act more human. But Aiden soon discovers he's no longer acting and-despite being a computer program-begins to feel something like affection surging through his circuits. He calculates that Jen needs a worthy human partner (in complete contrast to her no goodnik ex boyfriend) and slips illicitly onto the Internet to locate a suitable candidate. Tom is a divorced, former London ad-man who has moved to Connecticut to escape the grind and pursue his dream of being a writer. He loves his new life, but has yet to find a woman he truly connects with. That all changes when a bizarre introduction from the mysterious "Mutual Friend" pops up in both his and Jen's inboxes. Even though they live on separate continents, and despite the entrance of another, this time wholly hostile, AI who wants to tear them apart forever - love will surely find a way. 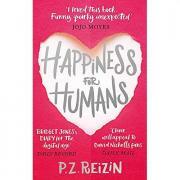 A thoroughly modern love story that will appeal to fans of The Rosie Project and Sleepless in Seattle, Happiness for Humans considers what exactly makes people fall in love. And whether it's possible for a very artificially intelligent machine to discover the true secret of real human happiness.